About 0.5 tonne, if it's dry, I would think. depends what wood it is as well. So quite expensive, for what I'm getting. BTW, just reading your contribution to the thread on looming gas and electricity price rises, Ken, and in particular the comments about stocking up with wood. I'd like to do that too. At the moment, I have cut and split logs delivered, but to supplement this I was wondering about the law and recovering fallen branches etc. in the woods. Can you summarise it for me if you know? ...... At the moment, I have cut and split logs delivered, but to supplement this I was wondering about the law and recovering fallen branches etc. in the woods. Can you summarise it for me if you know? I usually only collect wood from the local common from where I was given permission to take wood by the land owner, I'm not sure about collecting wood elsewhere but I would think that you need the landowners permission as my friend has in the case of the ash trees. As Candy says, if you were only taking a branch at a time when walking the dog and no one saw you you would probably get away with it. erm...how does "the local common" have a landowner?.. Not that I'm confused or anything. All commons are owned by someone but are subject to certain rights granted to people who live on or around the common who registered those rights under the Commons Registration Act of 1965. The landowner has the rights to all the product of the land that the commoners don't use. So, if you take a fallen branch you've 'used' the product of the land and therefore don't need permission? If you're a commoner, that is someone who's house has commoners' rights registered with the local authority. Suffering from a mild outbreak of general doom, I have been stocking up on firewood. I have just paid �80 each for two loads of oak, delivered and tipped. I would estimated each load as a bit more than a cubic meter. Looks to be excellent quality, and in ideal size pieces for a small stove. I have managed to nearly fully replenish my 5 woodstackers - enough to do me through a cold winter, so I am good for 12 months anyway. I collect/cut it all myself with only manual tools and as well as helping my general fitness, it makes me feel damn good. I work up my own. Delivered prices here are around $225 for split green hardwood About $60/ M^3 if you run the conversions. 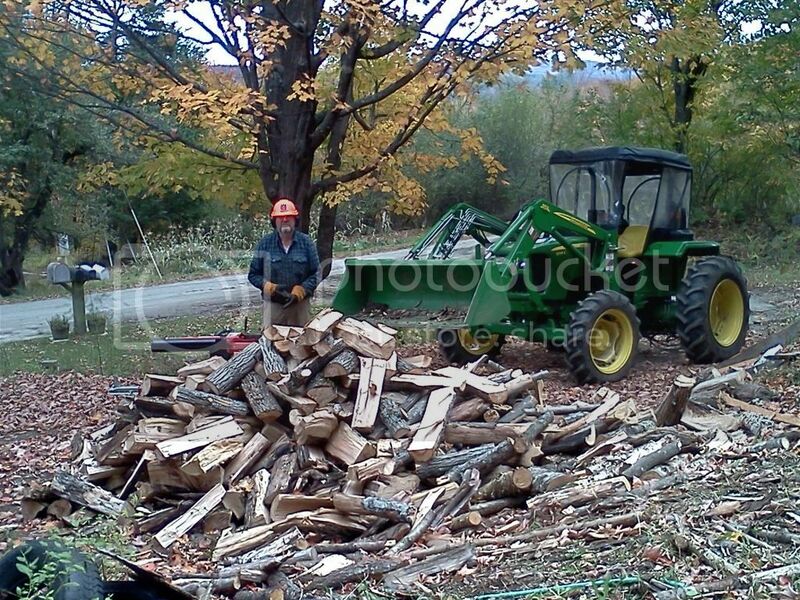 Dry wood delivered into the college towns in winter can go for $350 / cord or 128 cubic feet well stacked. I recently obtained a medium size tipper truck full of unseasoned oak for �70. Two large oaks were recently taken down for building timber, and I have got all the small or odd shaped pieces for firewood. Mainly small branches cut into short lengths but not split. It will need at least one summer of drying in a warm shed, two would be better. At present I am mainly burning large softwood logs purchased from the local sawmill some time ago. These did not burn well when first obtained, presumably not as seasoned as was claimed ! Fine after storing though. I can collect virtually as much softwood with some hardwood mixed in as I want for nothing but I have to cut it to final length and split it myself. I have a 3.5 tonne gross vehicle weight tipping trailer (2.35t capacity), a petrol driven log splitter and a daughter and son in law to help so the work involved is not too onerous! I have covered, ventilated storage for about 35 - 40 cu m of split wood and a big tarpaulin, a curtain side from an artic, for uncut wood and we burn about three trailer loads per year between the two households although we burn a lot more than our daughter does. She has a much smaller and better insulated house. We've got about 11 cu m of split wood for next year, 11 cu m of split dry seasoned wood for this year and another 11 cu m of dry, seasoned wood which we are about to split. I would say that if I get the unsplit wood cut before Christmas we will have enough cut for anything the weather can throw at us this year. If its mild again we will be virtually ready for next year as well. I've managed to triple our covered storage areas over the last year.